Need something to do for the fall now that the Halloween fun is over? Well here are a few fun fall activities you can do at school or at home. Enjoy! Fall Sensory Bin-I had some extra macaroni noodles that I colored with food coloring a long time ago, some old rotini and some ziti noodles. 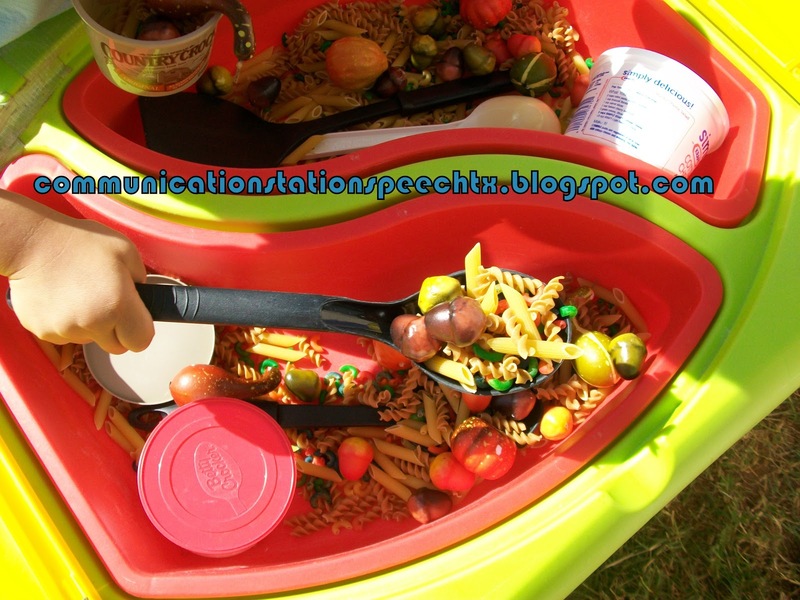 I decided to add the pasta with some plastic acorns and gourds I bought from Target’s $ bins to my sensory table. Threw in old butter and sour cream containers along with spoons and…voila’! We had lots of fun “cooking” up soup, ice cream, cereal and so many other concoctions! 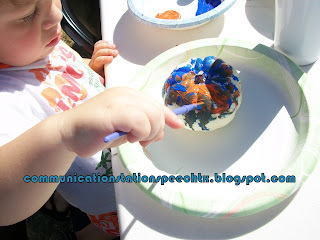 Pumpkin Painting: Pumpkins are NOT necessarily just for Halloween. We love our pumpkin spices in the fall and our pumpkin pies at Thanksgiving! So, I bought a few small white pumpkins (probably technically gourds), put some acryllic paint (I had in the house) in a bowl and gave the kids a paintbrush. Oh the language this activity produces! We talked about what we are making, what colors we were using and mixing together to make other colors. Great science experiment as well!!! Or you can cut the pumpkins in half and place face down in paint and use it as a stamper to paint pumpkin shapes! 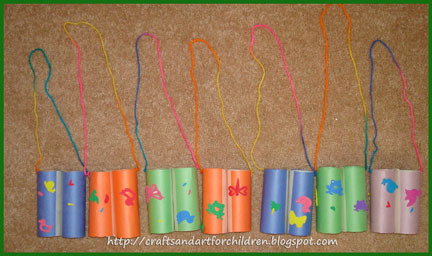 Autumn Treasture Hunt: Use toliet paper rolls and make some binoculars. Use your binoculars to explore the outside world and find some fall items such as acorns, pinecones, red/yellow/green/brown leaves, leaves with smooth edges vs. pointy edges, sticks, tree bark and maybe even some fall flowers! I did this with my son and he has a GREAT time exploring. I like this activity because its a great following directions activity with the use of multiple modifiers (colors, textures, sizes, shapes, etc.). You can focus on listening or reading compehension skills as well! And how fun is it to wear homemade binoculars around our necks while we search for our tall items! Fall Collage: After you go on your Autumn Treasure Hunt, you can take some of those wonderful items home and make a fall collage! We like to do this on contact paper becuase its fun to make our leaves stick but you can use paper and glue too! Whatever works for you. You can make this a fun directions task as well (e.g. “Place the red leaf above/below/next to the brown leaf.” etc.) Or have your child use some self talk to describe what he/she is doing when making their collage. Keep it light and remember to just have fun! Fall is such a great time to explore and experiment! Do you have another fall activity you love to do with your children? Comment below! Freebie Friday: Fall People Sentences! Freebie Friday: Summer Conversation Starters!